With the availability of third-generation synchrotron x-ray facilities, the properties of nanoscale materials are now receiving increased attention. In particular, the high energy and brilliance coupled with the tight focus of the x-ray beams at HPCAT now make possible detailed structural studies of nanoscale solids. 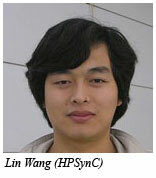 Lin Wang (HPSynC) and co-workers from HPCAT, Argonne National Laboratory, and Stanford have now shown that the compression behavior of nanoscale Y2O3, an archetypal rare-earth oxide, differs in significant ways depending on the particle size of the material. 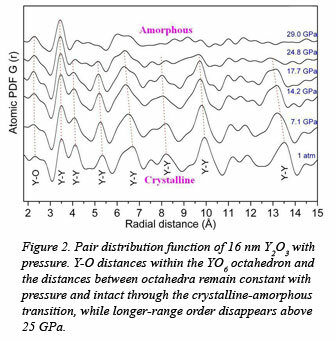 Using the microdiffraction capabilities of the HPCAT sector at the Advanced Photon Source, samples of Y2O3 with particle sizes of 16 nm, 21 nm, and 1000 nm (1 micron) were investigated to above 30 GPa. In each case, the ambient pressure structure is the cubic rare earth oxide (bixbyite) structure (Fig. 1). On compression, however, the 16 nm material becomes amorphous at 25 GPa, while the 21 nm material undergoes the well-known cubic-to-hexagonal phase transformation at 14 GPa. The micron-sized material, which is representative of the bulk solid, undergoes the same phase transition, but at a slightly lower pressure of 12 GPa. In addition, the 16 nm material remains amorphous on decompression, while the 21 nm material adopts a monoclinic structure on decompression rather than becoming amorphous like the 16 nm material, or revert to the cubic phase, as is the case with the bulk solid. 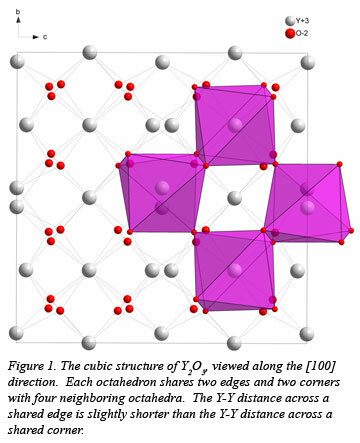 A pair distribution function analysis, carried out with the 16 nm material, shows that the Y-O nearest neighbor distances do not change with pressure, suggesting that the YO6 octahedra are essentially rigid and do not distort upon compression. The nearest-neighbor Y-Y distances across the shared edge also do not change and remain intact through amorphization. The onset of amorphization therefore appears to take place when the linkages between corner-shared octahedra reach a critical limit, at which point the longer-range order in the solid breaks down (Fig 2). . The work provides new insights into the behavior of nanoscale materials, in particular the point at which a collection of atoms begins to behave like the bulk material, as well as the phenomenon of pressure-induced amorphization, which is observed in a number of important oxide materials [L. Wang et al., Phys. Rev. Lett., 105, 095701 (2010)].